Namratha Turlapati, MD, is a board certified ophthalmologist whose practice is dedicated to adult comprehensive ophthalmology and pediatric ophthalmology. 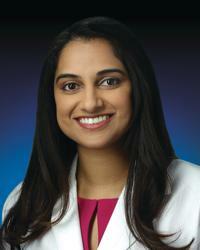 She has additional fellowship specialty training in pediatric ophthalmology and adult strabismus. She sees patients for adult and pediatric strabismus, amblyopia, blocked tear ducts, cataracts, diabetes, and macular degeneration. Dr. Turlapati takes a comprehensive approach to the treatment of these complications through the use of medical and surgical techniques, aiming to optimize the safety of patients when any kind of surgery is necessary. Her clinical interests include medical and surgical management of adult and pediatric strabismus, cataract, and refractive surgery. Her research interests include retinopathy of prematurity. Dr. Turlapati received her medical degree from Northwestern University Medical School before doing an internship program at the University of Illinois-Chicago. She then completed residency training at the Medical College of Wisconsin and a fellowship in pediatric ophthalmology at Children's National Medical Center. "My practice is very comprehensive. I see patients of all ages, beginning with newborns. My intention is to treat every patient as if they were a family member. It is important to me that my patients feel informed about their conditions and their treatment options. Through conversation, I create a safe space, where my patients feel comfortable and put their trust in me. I take a thoughtful approach to the diagnosis and medical needs of my patients. For this reason, I counsel my patients in treatment options that are the safest and fastest ways to improve their vision."